Happy new year and welcome to 2016. So I previously wrote about my first impression of the upcoming Microsoft Surface Hub. This was an overview of the device and basic capabilities. Fast forward a few weeks and I had the chance to properly test drive the Surface Hub and how it can work with video as I did not experience that beforehand. In my previous viewing of the Surface Hub, I was working for an SI. I am now working at Pexip so there is a bigger emphasis on the video interoperability piece. I won’t cover the other uses for the Surface Hub, that is covered in the first post, so straight into the video capabilities of the Surface Hub. So, it’s basically a 55″ or 84″ screen with two 1080p cameras mounted either side of the screen. The client is a next generation Skype for Business client on a Windows 10 OS. The forthcoming Mac OSX client is meant to be borrowing elements of the Surface Hub client UX which then run into the standard Windows desktop Skype for Business client. I’ve made a Sway of the overview here if you want to view that instead. So to make a call, just touch the phone icon and start searching for the name of the person/room/device you want to call as seen highlighted in blue below. Once you have the first person in a call, you can then touch the conference icon (second down) and add more people. The third icon is for instant messaging so you can easily chat too. Also remember that the Surface Hub ships with a keyboard (and I think a mouse too). There is an onscreen keyboard so that can be easily used too. When searching for contacts, remember this can be anyone in you organisation or a federated contact. 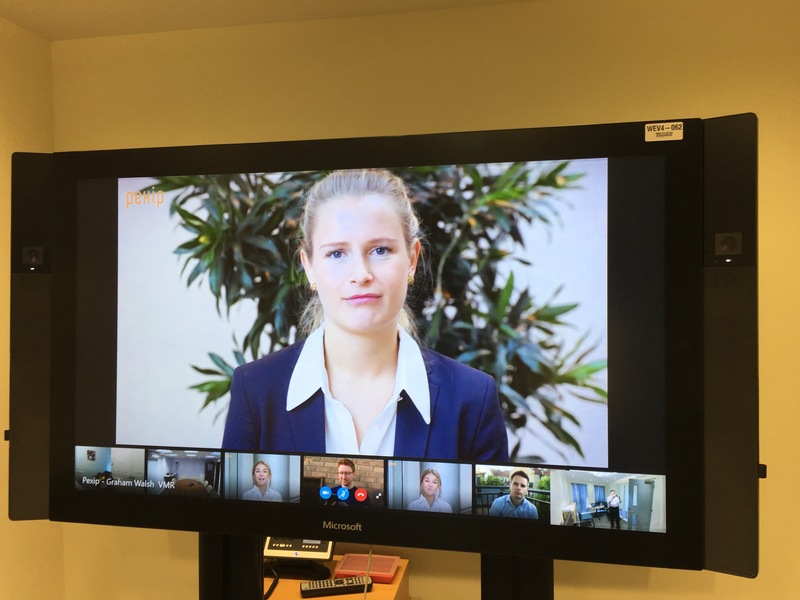 So in the above image, we have a federated call into a Pexip virtual meeting room. I’ll come back to this. So once you’ve established a call, say point to point with another Surface Hub or or Skype for Business client, you can then go about your normal collaboration session. This is great if you have Skype for Business everywhere and speak to people who have Skype for Business. What about that huge investment in Polycom, Cisco, Tandberg, Lifesize, Sony etc etc that you made? How do you call them? Well the the answer is with a Polycom system, if you have the Microsoft Interop license key on the HDX or Group Series, then you can call those systems. But what about the rest? Well a gateway would solve this mystery. As are we so nice at Pexip, we are offering a free Surface Hub gateway. Full details available here. So what can a gateway do for you? Well you can simply connect to a standards based room system from the Surface Hub using the standard UX. In my case below (as we were federated) I dialled IP@domain.com to reach the HDX that had a public IP address. This can be setup in a number of ways within your own organisation to make it simple to dial room systems. Now lets share some content from the Surface Hub. Simple enough isn’t it? So what does this look like on the remote system? Well that is simple, just as they would expect to see it, people and content one each screen. What the gateway is doing here is mixing H.323 video and H.239 content over to the Surface Hub which is H.264 SVC and RDP content. Clever isn’t it. Seamless to the average user. Basically the Pexip Infinity software can unlock the Surface Hub to standards based video systems. If you intend to stay in the Microsoft world of calling and utilise the AV/MCU from the Skype for Business server, then the experience is shown below. You only see two people on the screen and the third and any other people are shown and the blue person icon in the bottom left. The Skype for Business Windows clients still see up to five people in the gallery view. So the experience on the Surface Hub client isn’t great, just two people can be seen at once and you don’t know who else maybe on the call. So if you have taken us up on the Surface Hub gateway offer, you actually have a hugely powerful MCU that can do more than just gateway calls. So the concept of VMRs has been around for a while and it is a very simple one, provide each employee their own VMR and they can use it whenever they want for audio or video calling, regardless of the type of user that wants to connect in. Just give out the dial in number, SIP URI or URL to connect using WebRTC. So below is an image of what the Surface Hub looks like in a VMR call – a huge improvement on the AV/MCU experience in my opinion. Every user gets the same visual experience. Then you can send some content from the Surface Hub and of course annotate with it too. In the image below, you can see two different content streams from the Surface Hub being sent to a variety of devices. On my Mac, we are using a Chrome browser, so connected using WebRTC, so no add-ins required. On my Surface Pro 3 and Android smartphone, I am using the Skype for Business client and on my iPad I am using the Pexip Infinity app. Just simple and easy to use without having to think if the other users can see the content, hear you etc, it just works. Below, I’ve taken a snapshot of the content and annotated over the top using the Surface Hub. The other powerful feature in the Pexip Infinity platform when working with Skype for Business, the instant messaging function works too, so if you send messages from the Skype for Business client, then the Pexip Infinity users can contribute too. Another powerful feature of the Pexip Infinity Platform is that it can be used in a way so that if tradition video users want to experience the 7+1 layout option and the Microsoft AV/MCU users want to keep their gallery view, this is possible. What we can then do is merge the conferences together by simply dragging and dropping the VMR in from your buddy list. See the image below that has a conference running on the iOS device VMR and on the Surface Pro 3, there is a AV/MCU call. Then just drag the VMR into the current call on the Windows client and hey presto! This is showing a merged conference so everyone can see everyone. We can even go a step further and take the individual streams and send them to/from the Skype for Business AV/MCU but I did not get time to capture this. Now let’s supercharge the meeting have loads of people joining in, this is what it looks like. And this is what it looks like on the Pexip Infinity Server side, a cascaded call. And then remove them by separating the conferences. And the last video here shows you how to share content from the Surface Hub. Thanks for reading, please feel free to leave any comments or ask any questions and I’ll be happy to try and answer. Big thanks goes to Carillion Communications for the use of the Surface Hub for this interop testing. One final point, you may have seen in the news that the Surface Hub pricing has had a price rise even before it has been released by $2,000. There is also talk of delayed shipping but we are expecting our unit at Pexip towards the end of January (which is certainly better than March which was also rumoured). In summary, will it replace your video system in the boardroom, no. Will it be another form of collaboration that will give users choice, yes absolutely.